Embrace your inner medieval knight as you battle your friends. This Inflatable Jousting Arena game challenges your balance and accuracy to see who can keep standing the longest. Even if you fall, there will be a soft and safe landing. This ride is for ages 12 and up. Great for backyard parties, colleges and fund raisers. 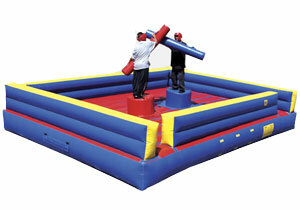 The Inflatable Gladiator Jousting Arena is a hit at every party! At only 5 feet tall this jousting arena also doubles as an indoor bounce house when the pedestals are removed. Setup space Required: 18′ x 25′ rectangular area. 5 Feet Tall. 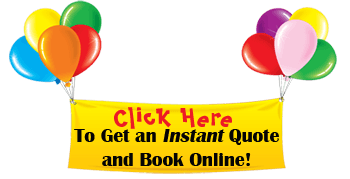 Due to the size and weight of our Inflatable Jousting Arena, we need know if there are stairs, steep hills, rocky terrain, narrow entrances, or any situations that require extra labor on our behalf.